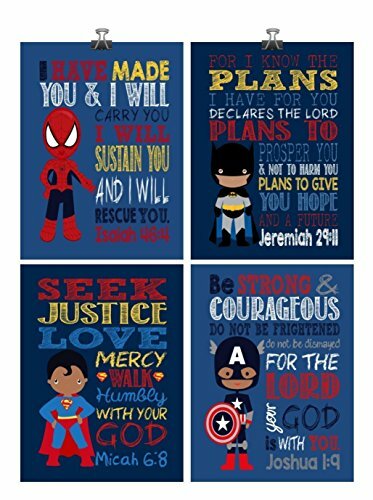 African American Christian Superhero Nursery Decor Art Print Set of 4 -Batman, Captain America, Superman and Spiderman - Multiple Sizes by Pixie Paper at Silence Is Sedition. Hurry! Limited time offer. Offer valid only while supplies last. These fun comic style art prints are great for your budding superhero boy or girl! If you love Superheroes, then these art prints are just for you! These fun comic style art prints are great for your budding superhero boy or girl! If you love Superheroes, then these art prints are just for you! Jeremiah 29:11 - For I know the Plans I have for you declares the Lord. Plans to prosper you & not to harm you. Plans to give you hope and a future. Joshua 1:9 - Be Strong and Courageous do not be frightened do not be dismayed for the Lord your God is with you. Isaiah 46:4 - I have made you & I will carry you. I will sustain you & I will rescue you. Micah 6:8 - Seek Justice Love Mercy Walk Humbly with your God. They will fit any standard size frame. Please note that colors may vary slightly from what you see on your screen, as monitors reflect all colors differently. If you have any questions about this product by Pixie Paper, contact us by completing and submitting the form below. If you are looking for a specif part number, please include it with your message. SENSORY GOODS Child - Deluxe - MADE IN AMERICA - Small Weighted Blanket 6lb Medium Pressure - Herringbone-Blue II Pattern/Navy - Fleece/Flannel (40" x 52") Provides Comfort and Relaxation.